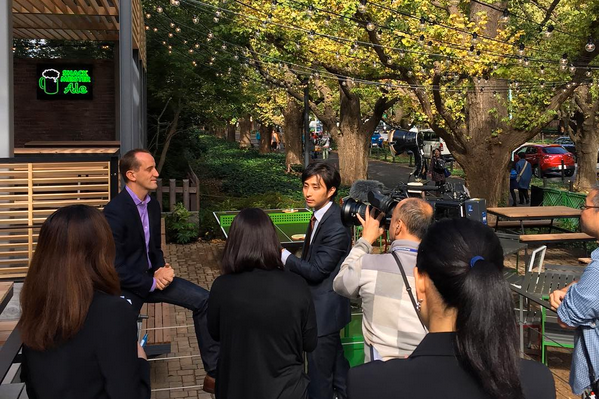 Shake Shack CEO Randy Garutti at opening in Tokyo (photo via @shakeshackjpn on Instagram). TOKYO — Shake Shack made its debut in Japan today when it opened a restaurant in Tokyo’s Meiji-Jingu Gaien park, aiming to appeal to increasingly quality- and health-conscious consumers in the fast-food space. Shake Shack’s positioning differs notably from other American players. The restaurant chain claims to serve premium, hormone-free ingredients, exclusive wines and craft beers. Most importantly, it underscores its "Stand for something good" mantra. In a general statement about the launch, Shake Shack said this mission "will play an essential role at the Meiji-Jingu Gaien Shack." The brand marked its debut by partnering with Hokago NPO After School, a community organization that aims to support children without homes. The premises itself is built from repurposed materials and features energy-efficient fixtures. The company is already active on Twitter, Facebook and Instagram in Japan. To promote its opening, it is offering giveaways such as branded tote bags and a customized bicycle created by local manufacturer Tokyobike. At a time when lower-end fast food brands like McDonald’s continue to struggle in Japan (the company lost nearly $240 million between January and September), how will Shake Shack fare? Devin Beringer, an American industry professional working in Tokyo as head of consulting and analytics at OgilvyOne, said he expected "an overwhelmingly positive response" given the enthusiasm for hamburgers in Japan and the fact that even restaurants serving "the humble pancake" have been able to generate large lines of customers. But Beringer added that "Japanese customers will really want to know about the ingredients, how they are sourced and prepared, and possibly even who farmed or bred them." A big reason for McDonald's woes in Japan is food-safety scares, which the company has taken steps to counteract with initiatives such as open kitchens and inviting families in to prepare food. "I would recommend they talk up this angle of their business — the quality and origin of ingredients as well as craft," he said. "Select use of local ingredients would bolster their argument, as American beef is generally seen as second class — but then again, American beef for an American burger does make sense." With competition for more premium and gourmet burgers fierce in Japan, he suggested that Shack Shack’s hot dogs, custards and even dog biscuits "might end up being as or more successful than the burgers." Above all, he said, Shake Shack should "keep an open mind and experiment to find the right combinations for the market" and exploit unique and seasonal promotions, which are "a must in Japan." Beringer added that Shake Shack had an opportunity to differentiate itself from competitors in the quick service restaurant sector online "by showing a lot more heart and soul." But he listed a pre-order app and delivery functions as features that would be immediately advantageous as a way of avoiding long the long lines that often form outside new restaurants in Tokyo. Lines at launch stretched more than 400 yards. Beringer suggested a continuation of the giveaway strategy, with mini competitions that drive people to the restaurant, could also be effective. Further areas to explore, he said, might include using social media as a tool to organize events and experiences linked to health, causes or culture, such as fun runs and exhibitions by local artists; movie nights; and initiatives around pets and children. "Events that celebrate them would produce a lot of content to increase reach online," he said. Finally, given the proximity of Shake Shack to a major baseball stadium, it would make sense to tie into the local fan base by offering discounts or promotions based on games or results, he said. Shake Shack reportedly aims to establish a total of 10 outlets in Japan by 2020, the year of the Tokyo Olympics. It operates in conjunction with Sazaby League in Japan, which has also worked with Starbucks and runs the Afternoon Tea chain.